Frasers Property Sales Director, Paul Lowe, has over 14 years experience in property development. He has worked on a number of high profile developments around the country including house & land, mixed use and high and medium density. Paul is responsible for delivering sales results and market share in these highly competitive industry segments. What is the biggest lesson you’ve learnt and what has most inspired you? The biggest lesson I’ve learnt is that the customer experience is pivotal to everything you do, as it is a holistic end-to-end journey you take with them. It is imperative to know your customer to be able to deliver and meet their expectations. My inspiration stems from being able to create some of the world’s best urban built environments and to be given the opportunity to learn and work alongside some of the industry’s greatest. How does working with a medium to high-density project differ from working with a master planned community? My preference is to see a satisfied customer and to see it come to life from an idea through to completion, to fulfil the dreams of people who have bought into the same vision. I don’t polarise one from the other. There is little difference when you focus on the customer as the same essentials and drivers are typical across both master-planned and medium to high-density communities. Everything is project dependent. Both types of projects have many components, and of course each has its own unique and inherent challenges, but all projects have a common denominator - the customer. If you focus on the customer, what you end up achieving is something really great and delivering on customer expectations. Do you believe that the industry is putting more focus on master planned communities? Yes, but the challenge lies in the availability of land, which limits opportunities close to the CBD. There is definitely a drive for more master planned communities within the framework of planning and State Government however it’s important to find a balance to ensure that we can provide the supply of new dwellings to meet the demands of the ever-expanding population. For buyers, it’s about affordability and options. Not everybody wants to live in a master planned community. Some want to live in high-rise apartments, the driving factors being maintenance, security and convenience, but master planned communities tend to be more about open spaces with inherit low to mid density of dwellings. Is there a trend with developers building a community within their projects? There is a growing trend towards building a community, whether in a vertical high-rise apartment like our major project Central Park, or master planned like Putney Hill. Irrespective of density, communities are about people and improving and supporting a particular lifestyle. It is about creating a sense of belonging, making people want to spend time at home and with their neighbours. What sets Putney Hill apart from other projects? Our goal and intention for Putney Hill is to redefine the quintessential Australian neighbourhood. 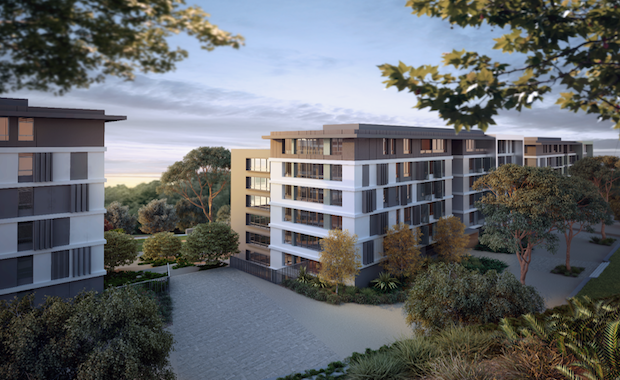 What sets Putney Hill apart from other master planned communities is its location and offerings of new homes and apartments with beautiful landscapes and green open spaces, which is not typically found in suburbs within 13 kilometres of Sydney CBD. What kind of community does Putney Hill hope to foster? Our vision is to create a vibrant, family friendly community. The inspiration came from the idea that you can live close to Sydney CBD and still enjoy the tranquillity of living in a community with parklands that provide a place to relax and unwind. We like to encourage a healthy, physically active lifestyle, as sports and leisure options are plentiful at Putney Hill, with walking, running and cycling tracks around the community’s central showpiece, Lardelli Park. Putney Hill is also in close proximity to Ryde Aquatic Centre, which offers a range of sporting facilities. There are also the facilities at Royal Rehab next door that residents benefit from. In my experience, master planned communities look to create a safe environment reminiscent of cul-de-sacs or neighbourhoods of the past where kids can play ball games without any perceived risks. Ultimately it is all about people, it’s about diversity and everyone coming together to form a new neighbourhood. What types of buyers/residents are you hoping to see at Putney Hill? We have a mix of resident demographics already, but overall Putney Hill appeals to those who wish to live in safe, healthy environment. We believe we fit very well with the empty nesters who are looking to downsize because their needs and requirements have changed, however Putney Hill is also well suited to professional couples and young families. What’s next for Frasers? Any big projects in the pipeline? We are a progressive developer, with a strong vision for the future, admired and followed by many including loyal clients and industry cohorts. Beyond future projects, we currently have future stage releases within our high-density project, Central Park, and master planned development, Putney Hill - so watch this space.